Who Would Teach for Cuckoos? 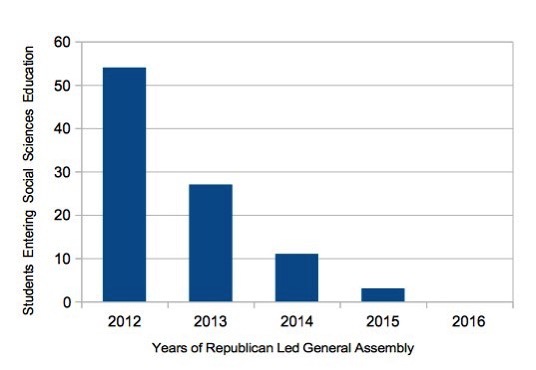 In the graphs below, I label the X-axis as “Years of Republican Led General Assembly,” referring to the years that North Carolina’s legislative branch has been dominated by the Republican Party, the first time since 1870. I regret using this distinction because I actually respect much of what I think the Republican Party represents. 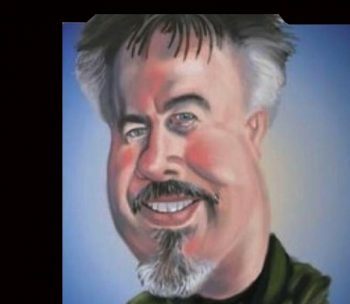 I am referring, instead, to the Cuckoo legislators, arrogantly conservative politicians who appear to be Republicans, holding just enough resemblance to push many fine and thoughtful statesmen out of the nest of North Carolina’s State Government. That said, I want to report on one of the many effects of their arrogance, and not the millions of dollars lost to the state as a result of their hastily written and passed HB2. I am no longer a teacher. I left the classroom for leadership roles in a time when teachers practiced autonomy in their classrooms and were rewarded for advancing their own educations. Today, I can barely imagine how demoralizing the last five years have been for North Carolina teachers, and for school administrators who are desperately struggling to fill their classrooms with qualified teachers. The solution to an alarming teaching shortage is simple, at least to the amateurs in Raleigh. Appear to grant a raise to teachers in North Carolina. Factoring in the nominal inflation of the past decade and a half, teacher pay in North Carolina has dropped 13%.1 Real and significant raises would certainly help and are certainly warranted. But there’s nothing new here. While teachers have always been grossly underpaid, we have continued to have talented and committed men and women wanting to become teachers. In my opinion, the teacher shortage has more to do with the declining conditions of the job and the increasing barriers that stand in the way of real learning in the classroom. A teacher’s passion comes from celebrating the meaningful learning and growth of her students. But today, the creative art of teaching has been spoiled by requirements to comply with government mandated standards that are measured by tests that choke real learning. ..And why would a high school student want to do, what they’ve spent 13 years watched their teachers dispair in not being allowed to do? I recently received a document from one of the state’s 15 schools of education that lists the numbers of students joining their various education programs since 2012, and the numbers SHOULD worry us. For instance, this graph illustrates the university students who are planning to become elementary school teachers. 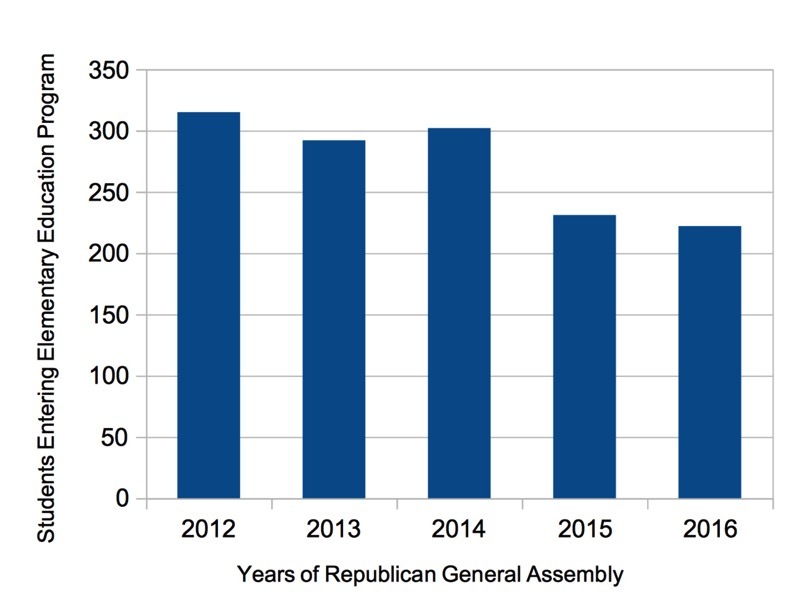 The decline, since 2012, represents a net loss of 213 potential elementary school teachers. 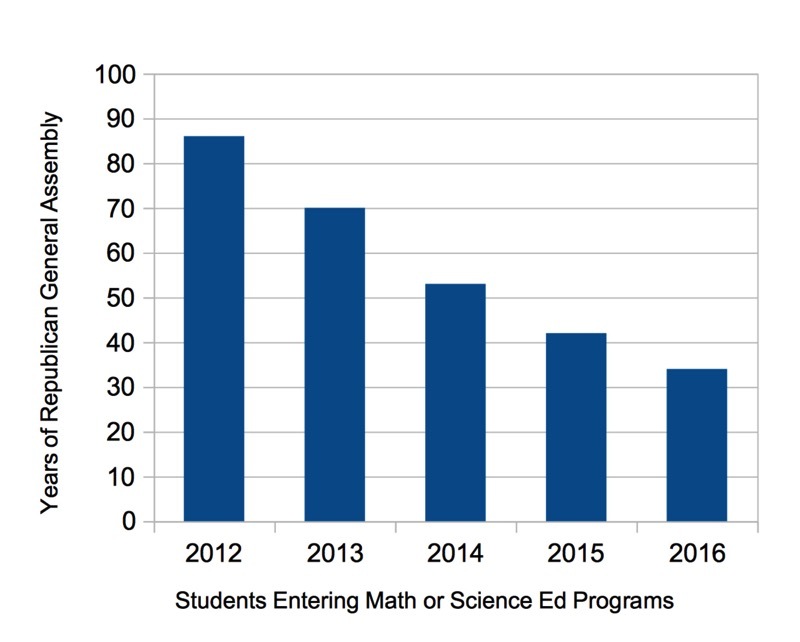 Equally disturbing are the numbers entering Math and Science programs, illustrated here. That’s 34% few Math and Science teachers than would have been likely in a more stable environment. And, as I’ve written many times before, the real problems of this state, nation and world have less to do with Math and Science, and more to do with our social condition – and we’ve lost 65% of the Social Studies teachers we might have had. In 2016, no college student in that university sought to pursue a career as a Social Studies teacher. Considering how teachers have been treated in this state, it is easy to fathom what these Cuckoo legislators fear the most. It is highly educated and organized teachers. In many of the state’s communities, the most educated citizens are teachers. 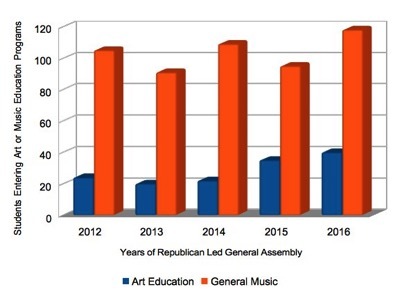 It’s why the General Assembly and Pat McRory (Governor) stopped paying higher salaries to teachers with advanced education (part of the Appropriations Act of 2013). We are the only state that does not pay more to teachers with graduate degrees. The result? A loss of 27%, though many teachers continue to advance their own education, even without compensation. 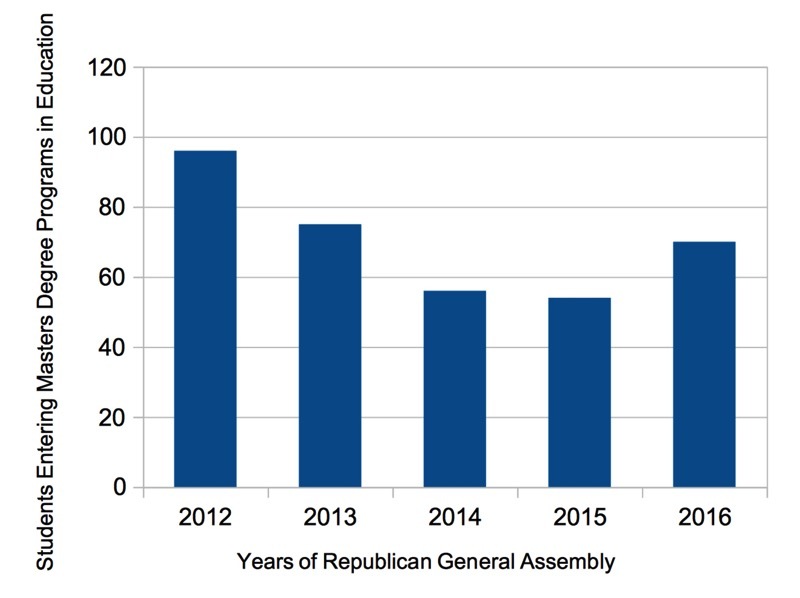 If you are a North Carolina voter, and you believe that the future of our state depends on the talent and intelligence of its citizens, then learn how your representatives voted on the final adoption of the Appropriations Act of 2013. If you do not know who your representatives are, go here. Then go here and click the name of your House member (here for your senator) to see their voting history in 2013-14 session. If he or she voted “No” to the final adoption of SB 402, the Appropriations Act of 2013, then they voted FOR teachers and stronger public schools in North Carolina. 1 Hinchcliffe, K., & Johnson, C. (2016, April 26). After inflation, NC teacher pay has dropped 13% in past 15 years. WRAL.com [Raleigh]. 2 Bonner, L. (2016, February 3). Enrollment plunges at UNC teacher prep programs. The Charlotte Observer[Charlotte].